Since his first professional gig with Ladyhawke in 2009, UK drummer Ben Kennedy has already collected an impressive list of artists he has worked with. 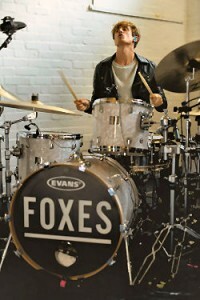 Since 2014, he’s been providing the groove for UK pop artist Foxes and has just finished recording drums for her new album, after a year and a half of touring. I met up with Ben just before the new album campaign took him on the road again. I know you started off playing the piano when you were young. What brought you to drums? I don’t know really. I started piano from the age of eight but I never really clicked with it. My grandad was a jazz musician, so I had some musical influence from him. I guess I always had an ear for music, but I found it boring to practice piano. I went on to trumpet but got tired of that pretty quickly too, but I then got a drum kit for my 11th birthday, never had a lesson before, didn’t know anything about it, but it was just instantly fun. Did you have lessons straight away? No, I kind of gave it six months. I had a friend who knew a little bit and he came round and taught me a few basic things and some rudiments. Later I started taking lessons with the teacher that came to my secondary school every week. I loved seeing a professional drummer showing you what a drum kit should sound like instead of just bashing around on it. I had lessons with him all the way through secondary school and also joined the school band. That got me playing with other musicians and gave me a taste of taking the kit out of the practice room. It all kind of stemmed from there really. You went to ACM. Was that the moment you decided you want to do drumming for a living? Yeah, I think so. I did my A-levels and didn’t know what to do after that. I didn’t really want to go and do a degree but ACM offered a HND course which got you playing every week with different musicians in different bands and I kind of just made an effort with it. I think they have a lot of musicians who just turn up but are maybe missing the enthusiasm to go to auditions and network. I just always had that in me and the college was a great platform for me. 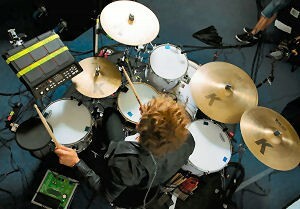 I think that if it wasn’t for going to ACM I don’t think I would have progressed and gone on to be a session drummer. I didn’t actually know I wanted to be a session drummer until I got offered my first session gig after finishing college. I was like: Ok, I can get paid for actually touring – that’s when it all hit home that I could be a session musician. I quit my full-time teaching job immediately. But it’s becoming harder and harder. The intake at some of these music colleges is quite high and we all know that there are not that many gigs out there that pay properly, are busy and also successful. Who were your influences when you grew up as a drummer? I guess the bands I listened to during my college phase were sort of more indie and heavier rock bands like Muse, Foo Fighters, Deftones and Rage Against The Machine, so I’m quite influenced by that heavy riff melodic stuff – but I’ve always been most interested in songs regardless of genre. That’s what got me started. I guess as I progressed further down the line I’ve become more pop orientated and just opened up to a spectrum of different music. Did you pick pop as your genre then? Not really, I kind of just slipped into it. My first gig was Ladyhawke, who was around from 2009. That gig suited me down to the ground: it had a rocky-pop vibe to it and it almost felt like I was in a band as opposed to being a session guy. I did that gig through to 2012, so it kept me busy for quite a while. That really set me up: it gave me the experience of touring and just doing it on a more professional level. We got some really high profile gigs out of it, which was cool. How did it that first gig come about? That was quite random: a bass player friend of mine who I knew was offered the gig and because I had just played a function with him that went really well, he asked me if I fancied auditioning. It all just went from there. If I hadn’t turned up to the gig, and I was actually umm-ing and aah-ing about it, or if I had said ‘no’ from the beginning, it just wouldn’t have set me up for future stuff. You never know who you’re going to meet on any gig so it’s important to get yourself out there as much as possible. 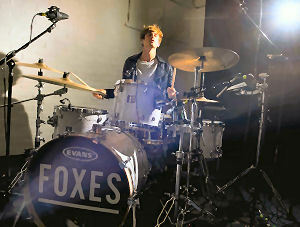 You’re now on the Foxes gig. Tell me more about that. Yes, it’s been really great. An MD who was playing with Foxes got in touch with me and asked me to come in for an audition. I think he just found out about me through my website. I really liked the music and made sure I had done my homework before I turned up and it just clicked straight away with the other two. It actually started out with just a three-piece: drums, keys and vocals. Now we have a live bass player too. We’re in between album campaigns at the moment. I toured the first album, which kept me busy for a year and a half, and then the turnaround on the second album is going to be quick. I recorded on the second album and we had a string of dates over the summer. It’s been really great because I thought there was going be a break but the label and management want to keep the momentum going and build on what the success from the first record. I think that’s very important, you can’t take your foot off the gas as new artists are coming through all the time and shelf life does seem shorter. That was the first Foxes album you recorded on. What was the process? Yes, I think I played on about nine tracks. Since February we’ve been going in and out of the studio for about four months and it was all signed off at the end of July. It was a very quick turn around. I was sent a demo of the song with sampled drums on it and would then show up to the studio and work with the producer and Louisa to put my own thing on it around the original demo. It was really nice to have creative input on the songs. The second single, a song called ‘Better life’, will be out in September and has Bastille singer Dan featured on it. That’s going be my first song I’ve played on which will be released. That’s really exciting. 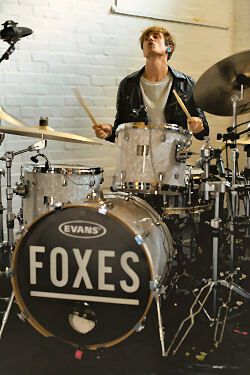 If you compare the two gigs, is the Foxes show much more ‘electronic-y’? Yes, I would say so. I think what we wanted to create with the Foxes gig was more like the album, so we had to find that hybrid between electronic and acoustic kit. This is probably the most commercial pop thing I’ve ever done, so in comparison to Ladyhawke it’s just more mainstream. Foxes has well written songs, they’re fun to play and I’ve been doing it for two and a half years and I’m still not bored of doing a live show. That’s a good sign. Was the electronic side of things something you were always into or was that new? Yeah, I had to kind of get my sh*t together for Foxes. We did have backing tracks in Ladyhawke but only acoustic kit. For Foxes the MD wanted to strip things back, take the backing track down and play as much stuff as possible live. For me it just meant doing it all on SPDS and trigger kick and snare to get the electronic sounds. There are still tracks but the keys player is doing many things, I’m triggering sounds and samples, we wanted to minimise the backing track as much as possible. If you look at your career path – what’s the plan for the future? I don’t know really. At the moment it’s great having that gig and being busy playing. My first ambition was to get my name on a record, I guess. With the new Foxes album coming out that one is ticked off the list. Later on I would like to maybe get involved in the other side of the industry: maybe management, working for a label or an artist, A&R… something further down those lines. You never know what’s round the corner so just stay positive and upbeat and wait and see what happens. Actually another ambition would be to have my own band, voicing myself, doing it from the start. It’s very hard though. Also I’ve almost gone too far into the session world. If I would do the band thing I would have to put the session thing on the side. What’s next in the schedule? More Foxes and I’m off to South Korea with Clare Maguire to do a show for Burberry. We’re just kind of finishing our festival season, we did Live Lounge which was cool, some gigs in Romania and Hungary – all kinds of things up until the album release in February. On the back of the album there is a UK tour coming up. Fingers crossed it does well, we all put a lot of time and effort into it. You can just never judge it nowadays – will wait and see. 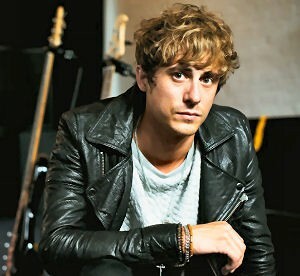 Best of luck for the new album and thanks a lot for your time Ben!